Last night at our small group meeting a couple shared something they had recently gone through that they thought would be helpful to the rest of us. It was. It provided a spring board for an entire evening of dialogue. I won’t go into the details, but the main part of the story was how this couple was having a great night out together. The conversation had been good, and they both enjoyed themselves very much. But then the test came. A heated incident occurred which sent them both reeling down a familiar path including outbursts of anger and lack of self-control. They went from “we’re doing great,” to “have we not changed at all? !” in less than 60 seconds. Their immediate impulse was to succumb to the discouragement and sulk in their defeat. It came rushing in like a flood and within minutes they remembered how far they had come. This was a test, reminding them of who they were before the grace of God rescued them from their own sin. This was an attack of the enemy of their souls trying to get them to think they hadn’t changed a bit. But they both knew they had. This is what made the fall feel bigger than it was. The truth is, it wasn’t a fall at all; It was more like a faulty step that threw them both off balance. But God caught them in the midst of the stumble and helped them stay standing. We’ve all experienced nights like these. Conflict comes out of no where and what was once a pleasurable evening becomes heated and leaves us discouraged. All of the couples in the room shared similar conflicts. The guys related to the anger over the situation. The girls related to the anger at the husbands for getting so angry. It became a bit of a “yeah, we know just what you mean,” scenario. We continued talking about how easy it is to never go back because you’re afraid you’ll just bring up the conflict and things will repeat as they did. This too is a lie from the enemy. Going back and talking about it is where growth and change takes place. It’s by being objective and looking back where we see how we tripped. The hope is that next time, maybe–just maybe we’ll see the familiar trap and by the strength God provides avoid it at all costs. Have you ever experienced an unexpected conflict that left you both dumbfounded at how you got there? Did you take the time and go back to talk about what happened? We encourage you to consider doing so. Realize though, it takes a mature commitment to growth and change in your marriage in order for this type of conversation to be fruitful, but this is how marriages grow. Ignoring the issues won’t make them go away, they’ll only fester and spread. This entry was posted in Christian Marriage, communication, Conflict and tagged Can We Talk, communication, Conflict in Marriage, Fruit of the Spirit. Bookmark the permalink. 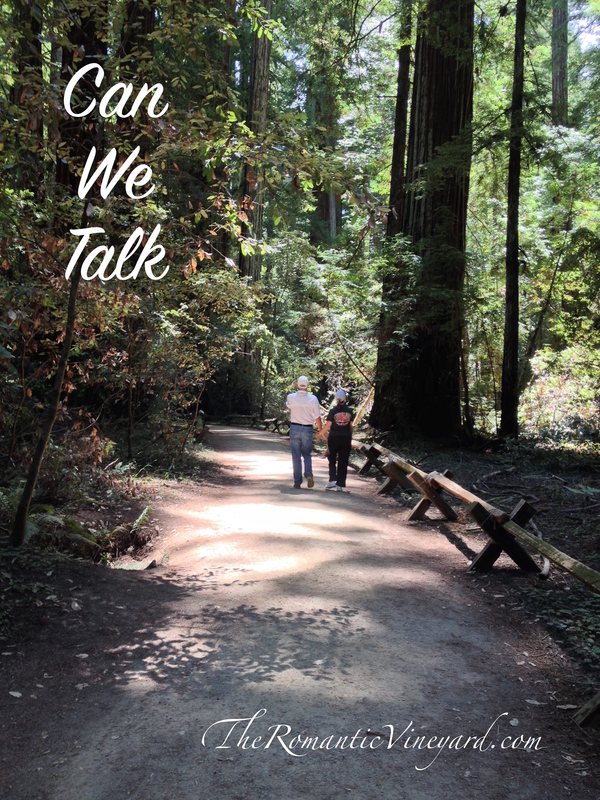 6 Responses to Can We Talk? Great post, and so very very VERY true. But my wife and I don’t really talk; she talks. I listen, and offer encouraging comments. This actually does work, because I have found that I don’t need to be heard. Virtually everything I had thought ‘worth saying” was really only voiced to gain support, as an ego-prop. Or, worse, to garner sympathy. My wife does not need to know my heart; she needs to know that I will be there to support her. Hmm, good point. I will think about that. What I was trying to say…clumsily.i.is that I have begun to realize that I really don”t HAVE anything to say. When i think about what I’m thinking of saying, it usually falls into the realm of the unnecessary. It’s talking for the sake of being heard, a placeholder. There is, at a certain point in life, a negation of personality that I think…and I may be wrong…frees one from the shackles of ego, and allows the service of listening, sympathy, and empathy without constraint. I no longer feel the need to be me, if that makes any sense? Praying that God will use this tool to change your heart and your marriage, as well as reach your wife with hope and help. Thanks for reaching out–God gives grace to the humble who ask for help.